di Gropello, Emanuela; Tandon, Prateek; Yusuf, Shahid (2011) Putting Higher Education to Work. © World Bank, http://elibrary.worldbank.org/content/book/9780821384909, Creative Commons Attribution CC BY 3.0 . The views expressed in this blog are soleley of the author and do not represent the World Bank. 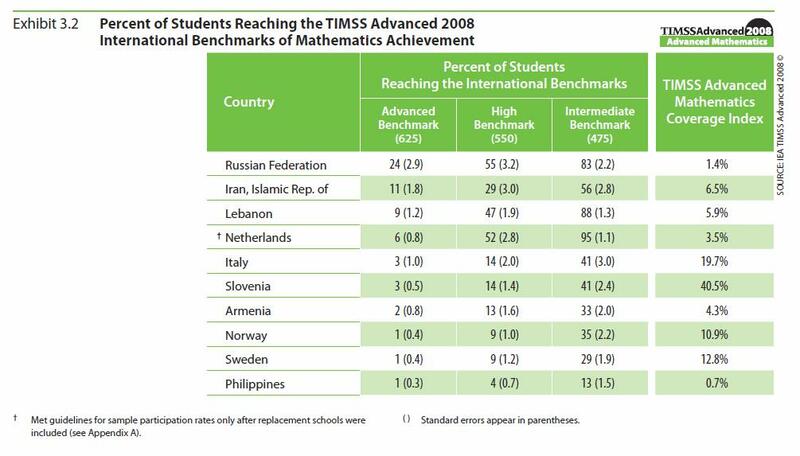 TIMSS Advanced 2008 Technical Report. Arora, A., Foy, P., Martin, M.O., & Mullis, I.V.S. (Eds.). (2009). Chestnut Hill, MA: TIMSS & PIRLS International Study Center, Boston College. • Higher education is at the top of the education pyramid and determines to a large extent the state of the education system of the country, especially its quality. As such it has a responsibility towards the whole education system and therefore towards basic education. • The system of higher education is the reservoir of the best equipped human resources and physical resources in any country having an obligation to help develop other levels of education including basic education. • Higher education is crucial for social and human development and therefore such linkages must be established by promoting basic education. 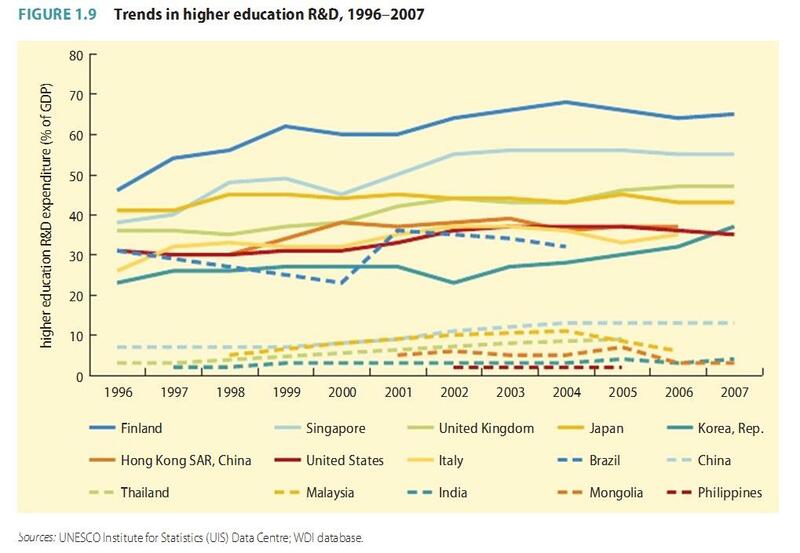 Massive illiteracy in many developing countries is making the role of higher education more challenging. • The thrust on early childhood care and education, universal primary education, youth and adult learning, literacy, gender disparity, all the six goals of Dakar Declaration has to be simultaneous. A comprehensive system of higher education consists of universities, non-university institutions, distance learning programmes, short courses and programmes of basic,applied and development research and extension services to serve the community. It serves its mission with three programmes: research (creation and preservation of knowledge), instruction and training (dissemination of knowledge) and community service (application of knowledge to serve the community). We shall examine below the role of each of these programmes to promote education for all. We start with research. applied and development research and extension services to serve the community. It serves its mission with three programmes: research (creation and preservation of knowledge), instruction and training (dissemination of knowledge) and community service (application of knowledge to serve the community). We shall examine below the role of each of these programmes to promote education for all. We start with research. For universities to get involved in the process of national development it is essential that they get involved in the development of their immediate community leaving behind the image of the ivory tower. Many countries in the world have introduced extension as a third dimension with instruction and research. The concept originated in the United States of America in the nineteenth century when universities have been engaged officially in the development of the community. Students and teachers get involved in adult literacy programmes, teaching programmes in rural schools, mobilise communities to participate in basic education and adult literacy programmes and universities are counted as great forces to discharge the power of literacy in the backward rural areas. "Education and therefore teaching is the primary duty of colleges/universities. But they have major service obligations to their communities and their country. For the great majority of citizens, it is the institution's outreach through service that most directly affects their lives. A second essential step, therefore, in strengthening the role of service in the university is to enhance research and scholarly work in ways that link the institutions more closely with the outside community. In fulfilling these responsibilities colleges/universities contribute directly to the life of wider communities across a spectrum of activities. Therefore there is a need to always look for ways to expose students to experiences beyond their day to day experiences in their own culture...."
Those who are faculty members of universities in the United States will recognize that the above matches the three criteria currently used for tenure and promotion decisions: research, teaching and service. The higher education institutions in the Philippines need to be evaluated similarly. 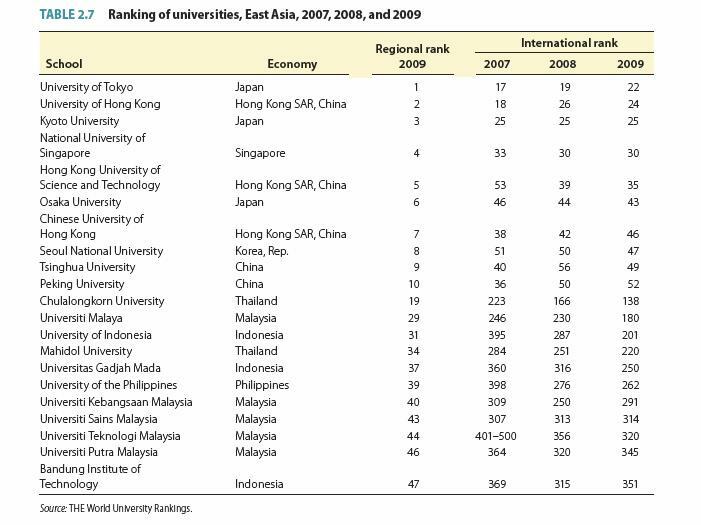 Sadly, as shown in the data below, universities in the Philippines are failing across the board. 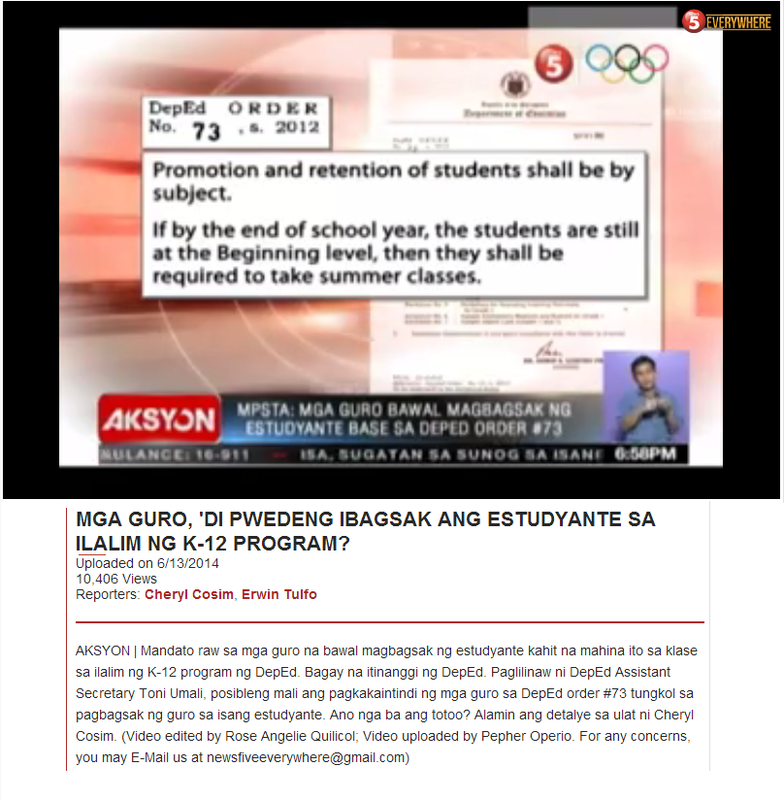 And this failure leads to the dismal state of Philippine basic education. 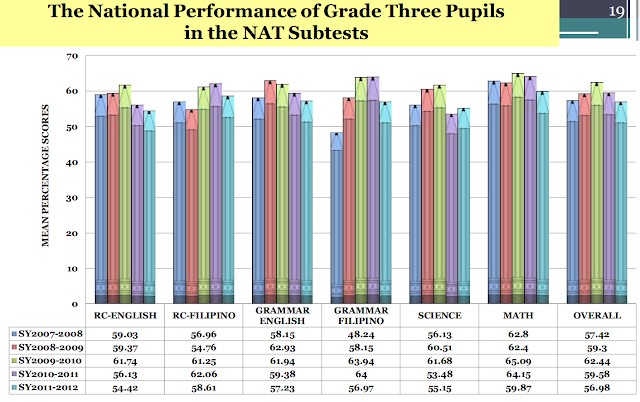 Some strongly argue that Philippine basic education is hampered by lack of facilities. There is a shortage of classrooms. The question is: In schools where facilities are adequate, is the performance of the students any better? The answer is no. Some say that the pupil to teacher is too high, leading to overcrowded classrooms. 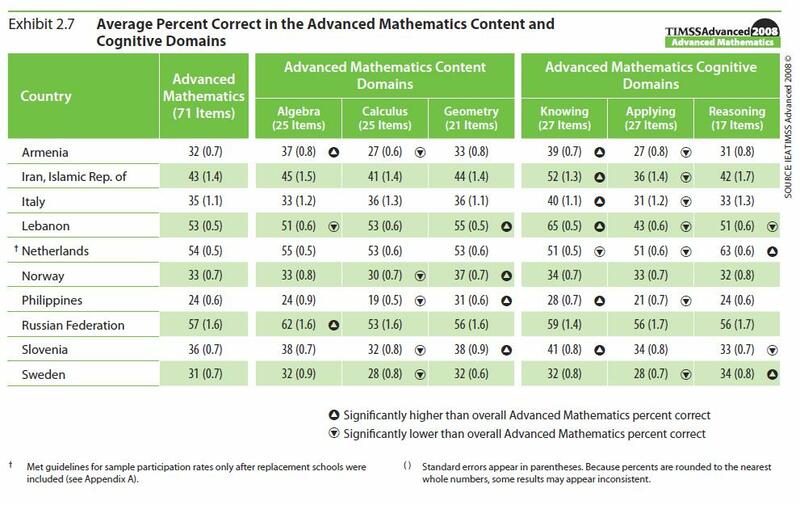 Again, one should ask, in cases where there is a more favorable lower ratio, are the students any better? The answer is no. Some say that teachers lack training in how to teach or the curriculum does not suit the learner's preference. The challenge here is to prove that this is indeed the case. DepEd is currently spending a lot of money on teacher training, specifically on the new K to 12 curriculum. Teacher training will not do any good if what is lacking is the teacher's mastery of the subject to be taught. The remedy to this problem is not training in a week or two. Teachers learn what they need to teach in higher education institutions. With this correct identification of the problem, it becomes clear that all the teacher training will simply be a waste of time, money and effort. “Does the problem lie with the teachers of the teachers? “Their academic preparation, which is Ed.D. 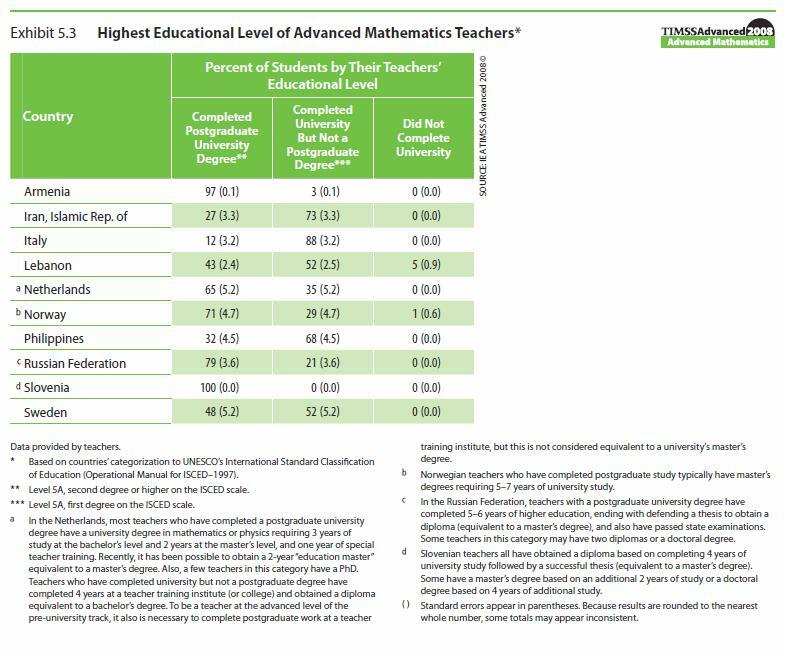 in educational management and leadership, does not entitle them to teach with confidence major courses such as modeling for math, biochemistry for biology and stylistics for English,” the report says. 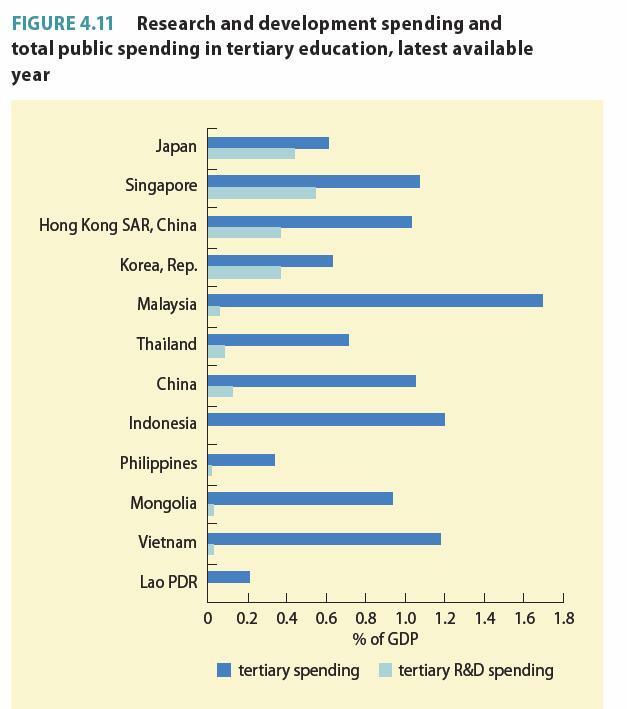 Higher education institutions in the Philippines have failed in supporting Philippine Basic Education, and the data, graphs that follow illustrate this clearly. 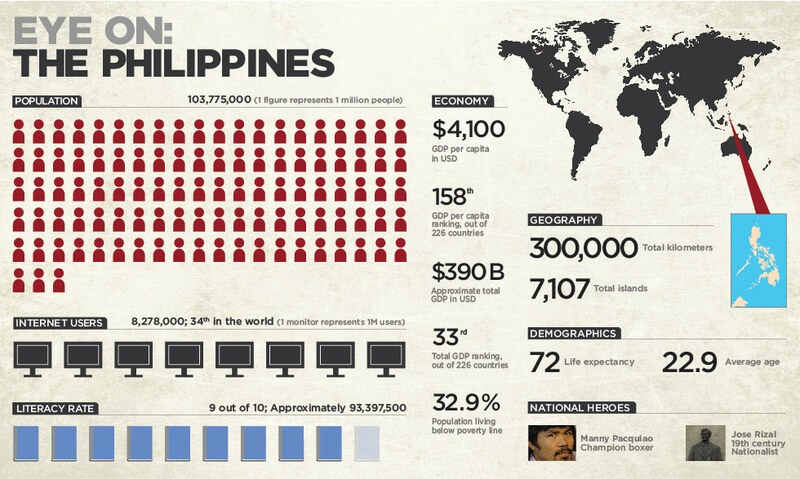 In these tables and figures, it is fairly easy to spot where the Philippines lies. It is either close to one axis (indicating that what is presented on the other axis is close to zero for the country), or close to the origin (indicating that the Philippines scores very low on both measures being presented on the x- and y- axes, or at the bottom of the table (This is self-explanatory)). 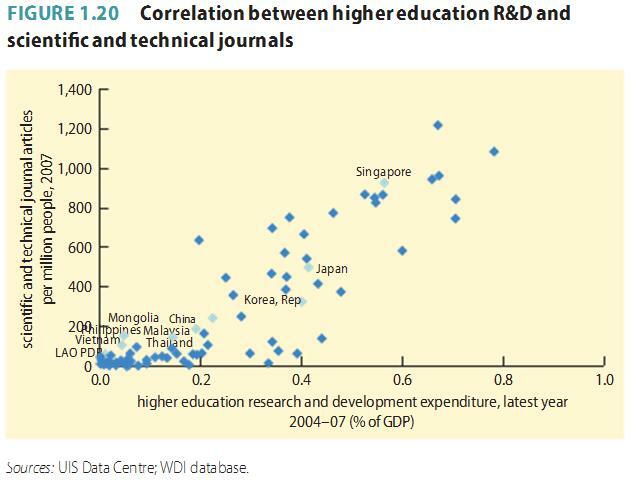 The graph shown above depicts how low Research and Development (R&D) expenditures are in the Philippines. It is way down in the bottom and is very close to zero. 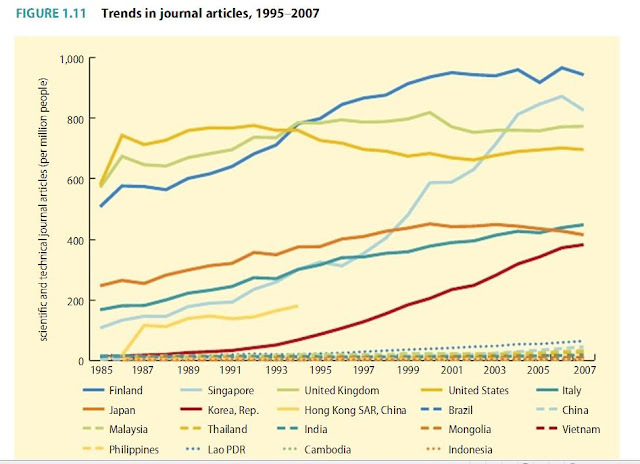 Articles published in peer-reviewed journals measure the scholarly output of a country. In this aspect, the Philippines is likewise at the bottom. Research is required to provide direction, assessment and analysis of the country's problems. Very importantly, research could only be verified and corrected by subjecting research through peer review. 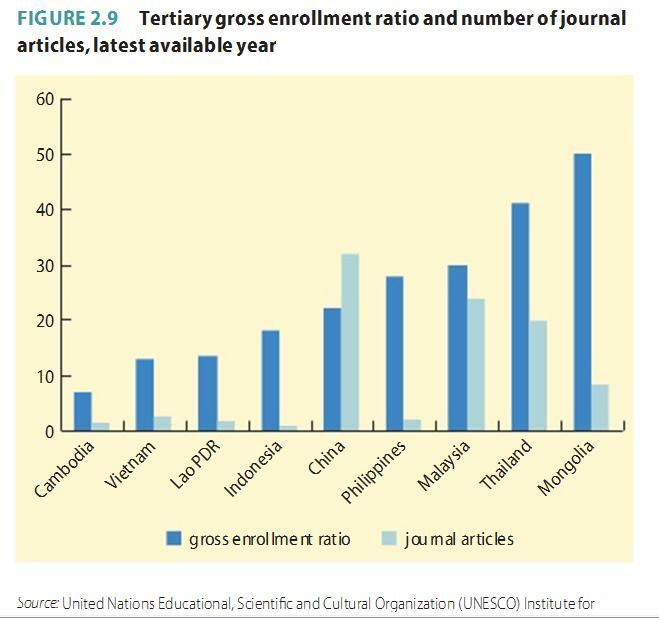 This graph shows the large enrollment in tertiary education for the Philippines compared against its very small journal publication output. 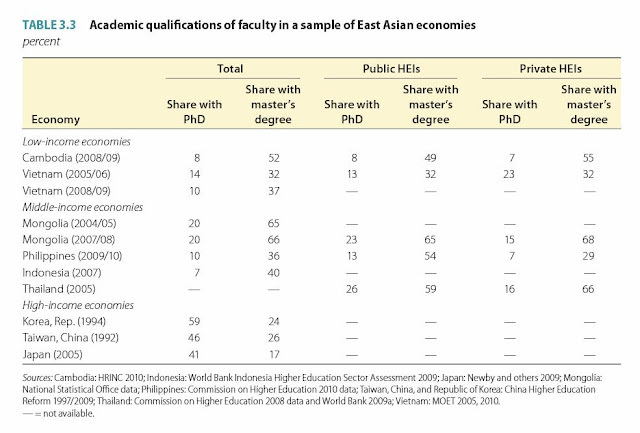 This comparison provides a picture of how small a role quality research plays in the academic life of tertiary institutions in the Philippines. 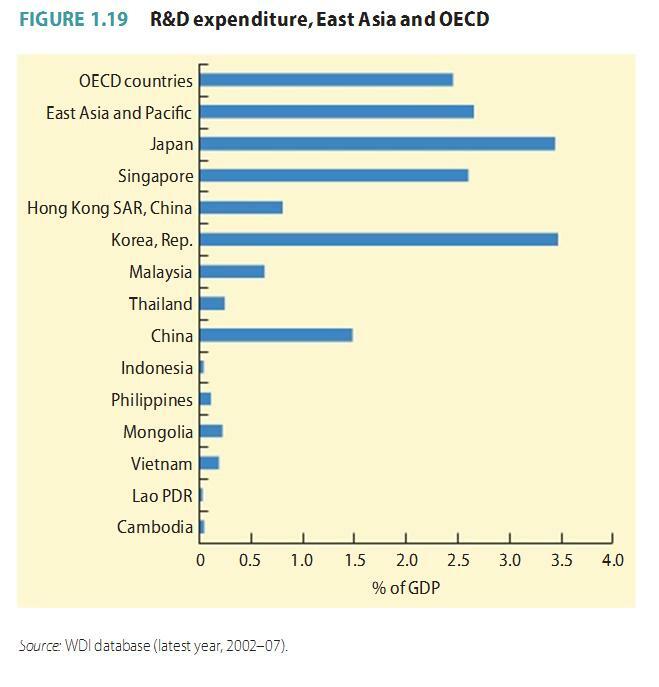 The Philippines, compared to other countries, clearly spends very little on research and development. 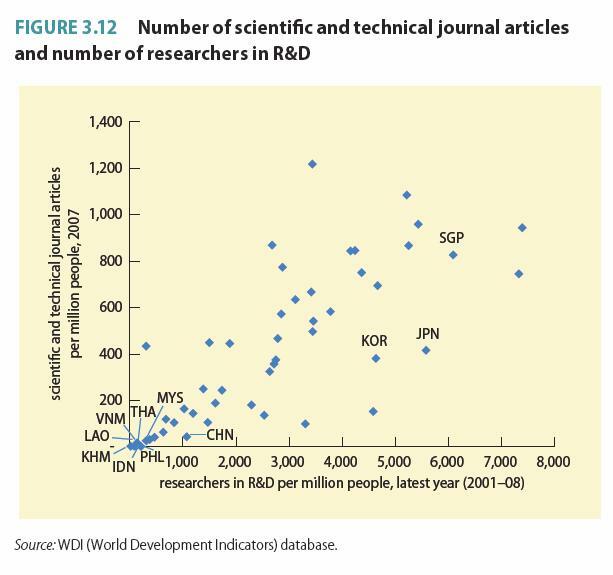 With very little investment in research and development, the publication output of the Philippines, not surprisingly, is very low. 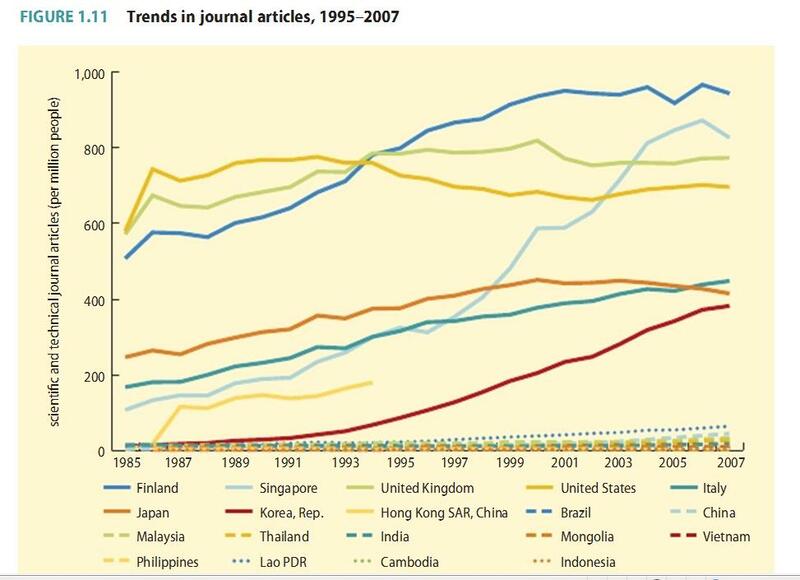 Not everyone in the Philippines is expected to produce scholarly work, but in this graph, the Philippines is showing hardly any. 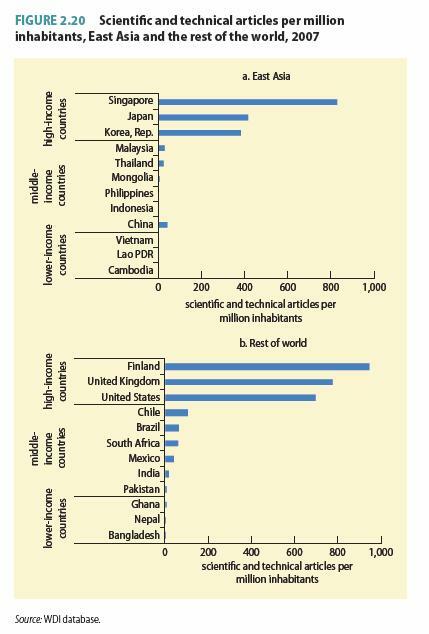 For example, for a population of 100 million, the Philippines needs to publish 2000 articles in a year (20 per million inhabitants) just to have a small blue blip showing in the graph above. 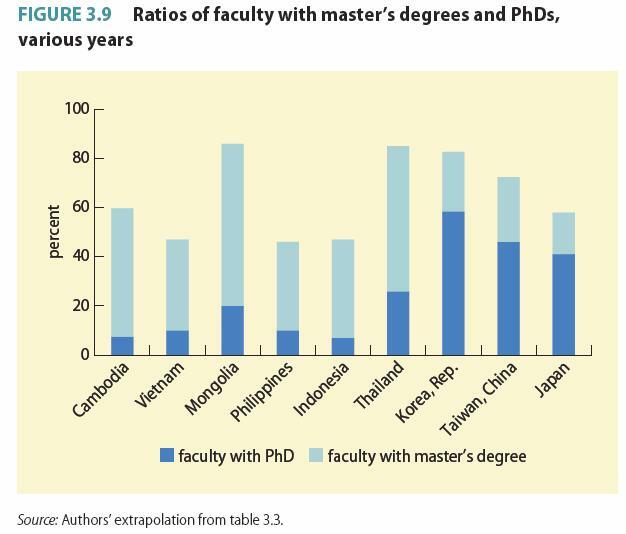 The small fraction of Master's and PhD in Philippine universities provides a good reason of why teachers graduating from these schools lack the mastery required for good teaching. Without researchers, there will be no publications. And without these researchers, reforms required for example to fix the Philippine Basic Education System cannot be guided properly. 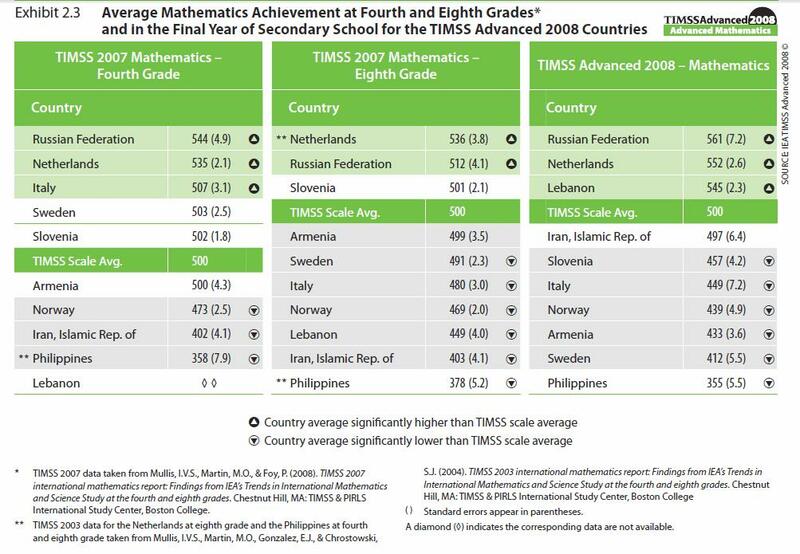 The Philippines scores the lowest in both Math and the Sciences. These are for eight-grade students. Adding two years at the end of the high school does not and will not address this problem. 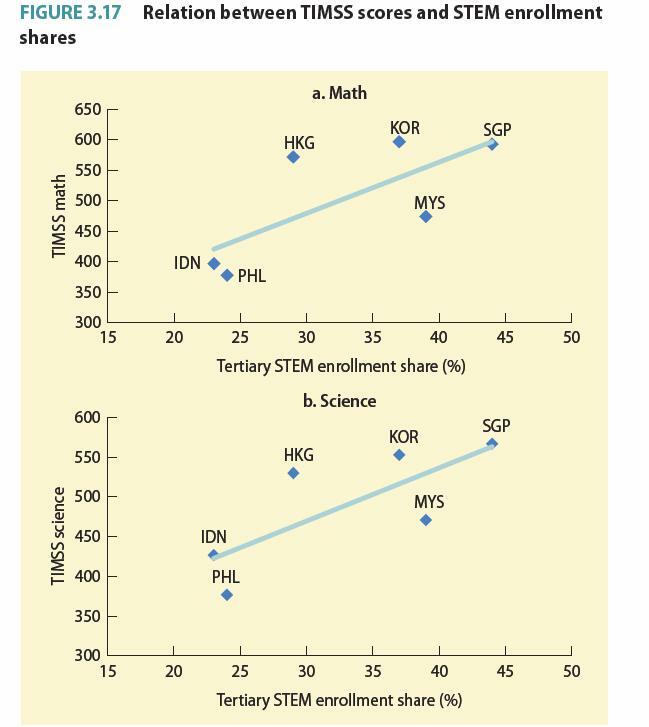 The enrollment in the sciences and related fields is also very small for the Philippines and this correlates with the poor performance of Philippine students in the TIMSS. 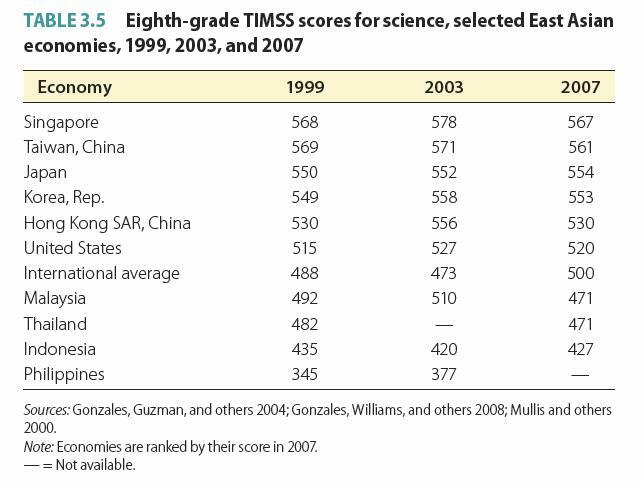 Countries with low scholarly publication output are also the countries that perform poorly in TIMSS. The Philippines not only spends less on R&D spending, but also on overall tertiary spending, compared to other countries. There are no teachers. There are no scientists. There are no researchers. This is the reason why the problems in basic education could not be addressed. The nation does not recognize what proper research is and what publication in peer-reviewed journals entails. Inspite of the problems in basic education, it is still possible for a country to produce scientists and researchers. This is not a classic "hen and egg" problem. In the case of education, the dependent and independent variables are known. Higher education (independent) is on the x-axis, and basic education (dependent) is on the y-axis. 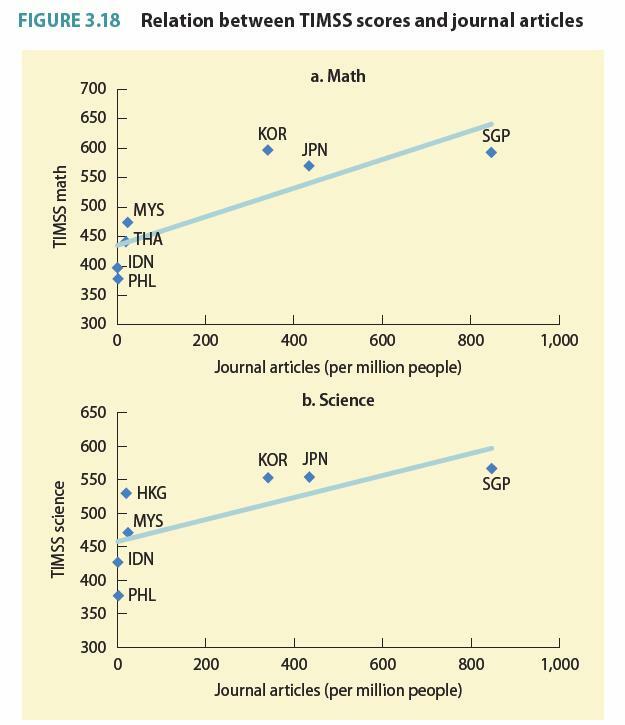 Research output as in publications in peer-reviewed journals is on the x-axis and the TIMSS scores of grade eight pupils are on the y-axis. 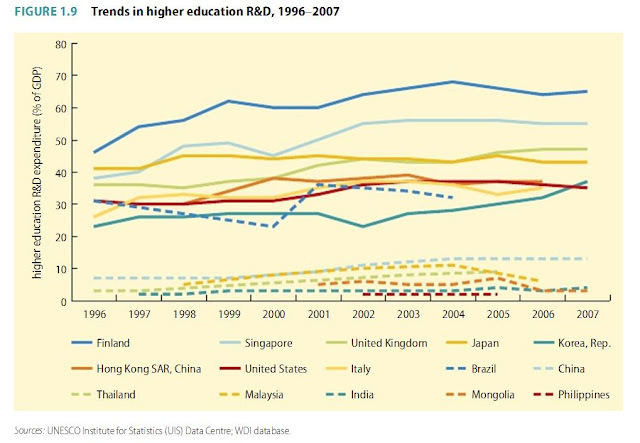 Most of the Filipinos who managed to get trained for scientific research are, unfortunately, not in the country. The Philippines has not tried to reverse "brain drain" and attract Filipino scientists abroad in a serious manner. 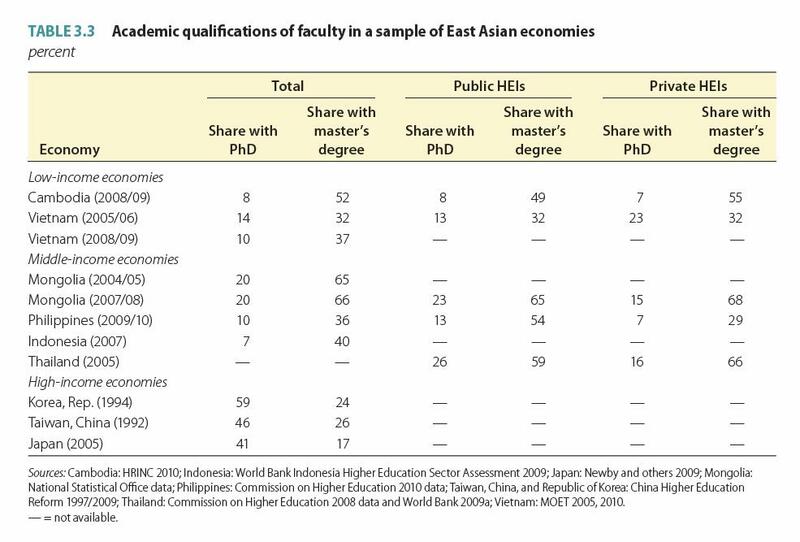 Universities do not have qualified faculty. As a result, the teachers who come out of these universities do not know the material that they have to teach and reforms addressing problems in basic education are drawn based on ideology and biases, and not on quality research. 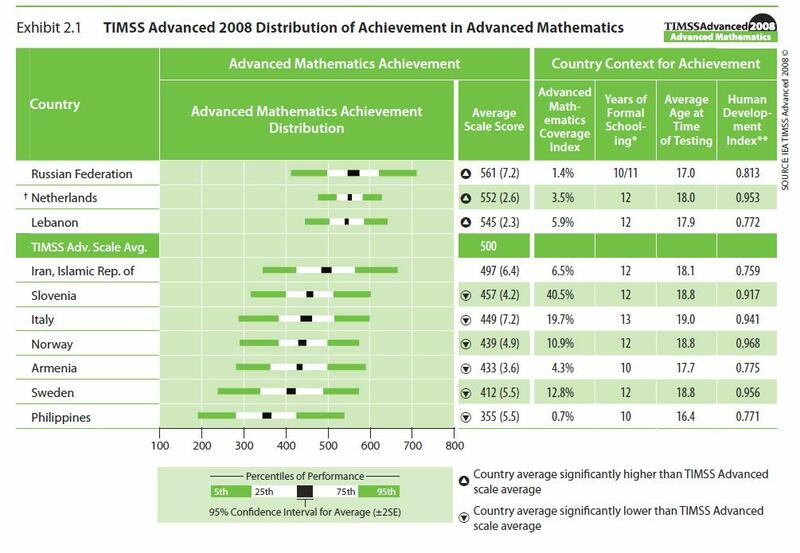 "....Around 60% of children in the Philippines enroll in high school, but just 1% of those in their final year receive qualifications in math and physics, according to a 2008 report from the International Association for the Evaluation of Educational Achievement...."
One could try to reproduce some of what Singapore has done. decades. An obvious thing is to work in photovoltaics. China is big in this area and might be happy to work with a country with an English-speaking workforce. Bring back the best Phillipine diaspora in this area, and augment with foreign manpower. government is business-friendly, and the workforce speaks English. Same with pharma. Shell has a HUGE facility in Singapore for refining. Asthma medicine is made in Singapore for Pfizer. Singapore is working on biotech now (they have a huge "Biopolis" project). come, and begin development of a world-class academic capability in this narrow area. The problem seems to be that the Phillipines has a HUGE dysfunctional system in place. It cannot be scrapped overnight, without huge social upheaval. The country CAN build something good, but small, from scratch, but it takes leadership and vision, and the humility to admit when "you" need to bring in outsiders when "you" don't have the expertise to do this well using domestic talent. Singapore is quite proud of what they have done, and would be happy to work with friendly neighbors and they could be very good allies in this effort. Let's face the truth that a lot of Filipinos are out of school youth.... that due to poverty and meager income of an ordinary family. K to 12 is answer.Just goes with the flow and accepts the benefit/s of it and for sure everybody will become a better one. hi. just dropped by to say how much i appreciate you taking time to share such wonderful posts. I agree that some people in the Philippines can't afford to send their children to school due of poverty and government should give help them about this issue. Education should be given to children because that is one of their right. Hopefully, poverty will be solve. It is true that without higher education, basic education can not progress. The role of research that is shared in this article is justified. However, it's strange to hear that Philippine basic education is hampered by lack of facilities and also there is a shortage of classrooms. 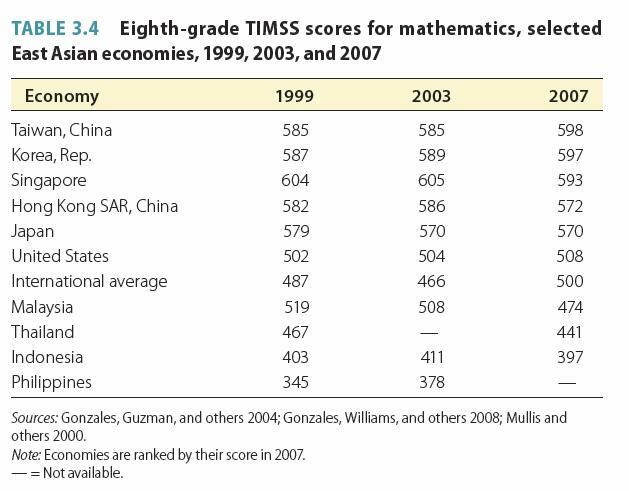 Also, the data shown in the tables is really shocking.